If you believe the headlines, the biohacking – or grinding, or cybernetic enhancement – scene consists of one lone wolf sticking a chip that gets them access to transport systems inside his/her hand every couple of months. Wait a while then the next one comes along, complete with all-caps sensationalism, like clockwork. It's been two years since we first talked to Tim Cannon and the future-thinking biotech movement Grindhouse Wetware based in Pittsburgh, US. In 2017, using hacker-style techniques to enhance your biology with tech is happening all over the world. It's tricky to estimate how many people are involved, but the unofficial movement includes everyone from individuals buying kits online or going to body modification artists in hubs like San Francisco, Austin, Boston, Sweden and Australia. We are also in an interesting spot in the hype cycle between the initial, dazzling implants and pioneers and whatever comes next. This is neatly encapsulated by the experiences of a cyborg I know. Katie Collins, a London-based reporter at CNET, had an NFC microchip, the size of a grain of rice, inserted into her hand at IFA 2015. She did it in the name of intrepid tech journalism, to create a video of the procedure, but also because she's interested in transhumanism. I asked her how much she uses it these days. "To be honest, I've been quite lazy about testing my chip's capabilities," she said. "It's my party trick – I use it to automatically open the CNET home page when I tap my phone against my hand. The rest of the time it just sits in there dormant, but as new things become possible I may start to use it more and more." I may have mocked the headlines about turning implants into tube/bus/train cards but this, along with payments, is one of the next big use cases on the horizon – in a much more joined up way than we've seen before. So far we've seen a lot of magnets and a lot of NFC ID tags but that could all be about to change. 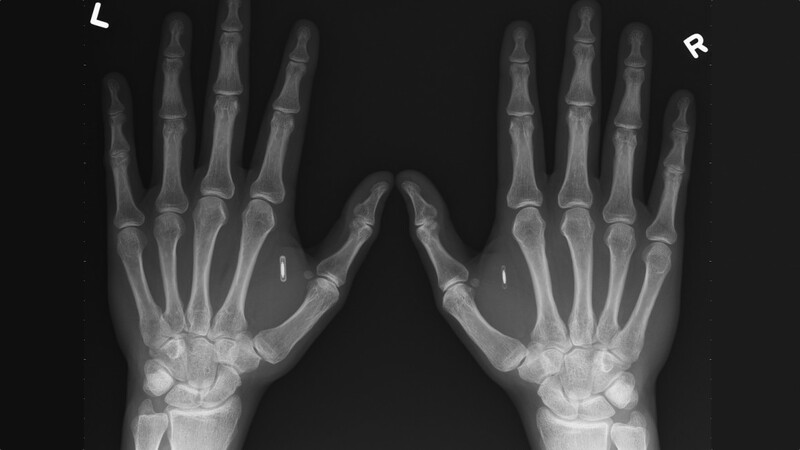 Hannes Sjoblad, cyborg and one of the founders of the Swedish Biohackers Association, collaborated with the Swedish rail company SJ on a potentially revolutionary project to allow NFC implant payments on its lines. Launched in June of this year, SJ expects only around 200 people to use the method to begin with – it isn't offering the procedure itself – but Sjoblad says he and his colleagues have chipped over 1,000 people in Stockholm alone in the past year. Often a company will put on the event, then people can choose to swap their work pass for implant access as well as get involved in a spot of "social hacking" to get library, gym or other membership cards added. "I host implant parties all over the world – I've been to the US and Mexico, Singapore and Malaysia, all over Europe hosting implant events," he told us. "There is an enormous interest, surprisingly big, and I think it's very much driven by pop culture." As for transport, the SJ project is a good start and proves that the tech can be more useful. "That was for us an interesting breakthrough. This is a billion krona turnover organisation – a lot of people use it." What's available now for payments is "not particularly safe [security wise], they can only be used for a PayPal type solution," says Sjoblad. "You transfer money into a separate account and put £20 on your chip and use your implant, for example, at a music festival if you don't want to bring a credit card." As soon as later this year we could see the first implant that makes secure NFC payments from a swipe of a wearable-less wrist a reality – but there's a catch. VivoKey (the new name of Project UKI) from Dangerous Things is being built to support encrypted Bitcoin and transport payments and should launch in mid-September. While it could technically be able to communicate with the contactless payment terminals you see in shops, though, it will need Visa, MasterCard and the banking apps to get on board to make it work. Of course, when you start to add more and more functionality, Sjoblad points out that battery becomes a real issue. Implants benefit from the miniaturization of components from the smartphone and wearable tech boom but smartwatch makers are still struggling with power versus weight. That's all very practical and curiously mainstream but what about the big ideas from the grinder community? That's the other side of the coin when it comes to where biohacking is at right now, specifically what it can do within the health tech space. For this, you'll have to be more patient. "I'm most excited about the ability to constantly monitor and record physiological data from the human body," says Ryan O'Shea, adviser/spokesperson for Grindhouse Wetware and co-founder of AI startup Behaivior. "Grindhouse Wetware is creating a new version of the Circadia implant, which will make this dream a reality." We first heard about Circadia from Tim Cannon in 2015. The ambition for Circadia 2.0 was an implant that can measure blood pressure, heart rate, blood glucose and oxygenation levels in order to know how stressed you are, how emotionally engaged you are or even whether you're in love. Then, Cannon predicted this breakthrough was "a year or two away" but O'Shea says that he doesn't expect to see any new implants released in the next six months. As he rightly points out, "six months is not a long time when you are talking about the design, testing, and commercialisation of hardware and software that is to be installed in the human body." When we return to what is possible, though, it gets better. Think of any category of innovative wearable tech right now and it seems that the grinders are working to cut out the need for a wearable device. Take the new-ish trend of headgear designed for brain enhancing applications as well as experimenting in thought controlled gadgets. O'Shea tells us that another exciting technology "coming soon" will involve "the ability to interact directly with the human nervous system to both send and receive information. This will essentially make it possible to use thoughts to control devices. Grindhouse is experimenting with this possibility now." Aside from the privacy and security considerations, which will no doubt be debated endlessly, there's a lot of non-technological work that needs to be done. If you want to get a no nonsense overview of what needs to happen when it comes to the ethics, laws and medical standards of experimental human enhancement, I suggest checking out Alex Pearlman's paper, which she published on Medium. One important distinction that comes up again and again is the need to delineate between medical procedures and therapy and "augmenting humans to overcome biological limitations" as Grindhouse Wetware's spokesperson puts it. Pearlman is a bioethicist and journalist completing a bioethics & society Master's at King's College London. She thinks we are close now to "implants and other low-key cybernetic enhancements being a real issue for real people in the real world – as opposed to what it's been so far, which is a hypothetical issue for technophiles and early adopters." For that reason, she is suggesting that the cyborg and transhumanist community mimics the traditional lobbying model: "That is, those with a vested interest in how the laws are written, and experts in the field, are encouraged to have a say and the legislators listen and take advice from the experts. And the diversity of opinions is also key to the conversation – this level of diversity didn't exist on this topic until now." It's a call echoed by the other people I spoke to. Sjoblad says it's "high time" to talk about laws and standards in 2017 and O'Shea goes further, saying we need "a whole new industry of people who are trained just as modern doctors are, but are licensed to augment otherwise 'healthy' humans." That might not be the stuff of short, snappy headlines, but we reckon it's more exciting. Are you interested in biohacking or part of the grinder community? Let us know in the comments.